Every now again I get surprised by a photo, showing me something I didn’t know about. And I love it even more when that surprise is from an object I thought I knew! Isn’t that stunning? This picture was taken by the MPG/ESO 2.2 meter telescope in Chile, and once you get over its beauty you’ll realize this galaxy is, frankly, seriously messed up. But check out that wide swath of dark stuff across the middle! That blocks the light from stars behind it, so it’s a cold certainty that’s a dust lane: a thick, flat disk of complex molecules commonly seen in galaxies. But… it’s commonly seen in spiral galaxies like ours, not elliptical ones like Cen A. So something’s weird right off the bat. And note how the ends of the disk seem bent in opposite directions; on the right it’s bent down, and on the left it’s bent up. Most likely, this is because Cen A ate another galaxy. Literally: a galaxy collided with it in the recent past – well, like in the past few dozen million years – and that galaxy was probably more like our own, rich with dust. As it was absorbed, the dust was stripped from it and settled into that disk. The warping at the ends is a gravitational effect, most likely a distortion from the collision itself. We see it in other galaxies that have nearby companions. When you observe Cen A using a radio telescope it gets weirder: two huge jets of material are being shot out of the core. The image here shows those jets (click to embiggen). Cen A is a very strong emitter of radio waves; in fact that’s why it’s called Cen A: the brightest radio source in the constellation of Centaurus. 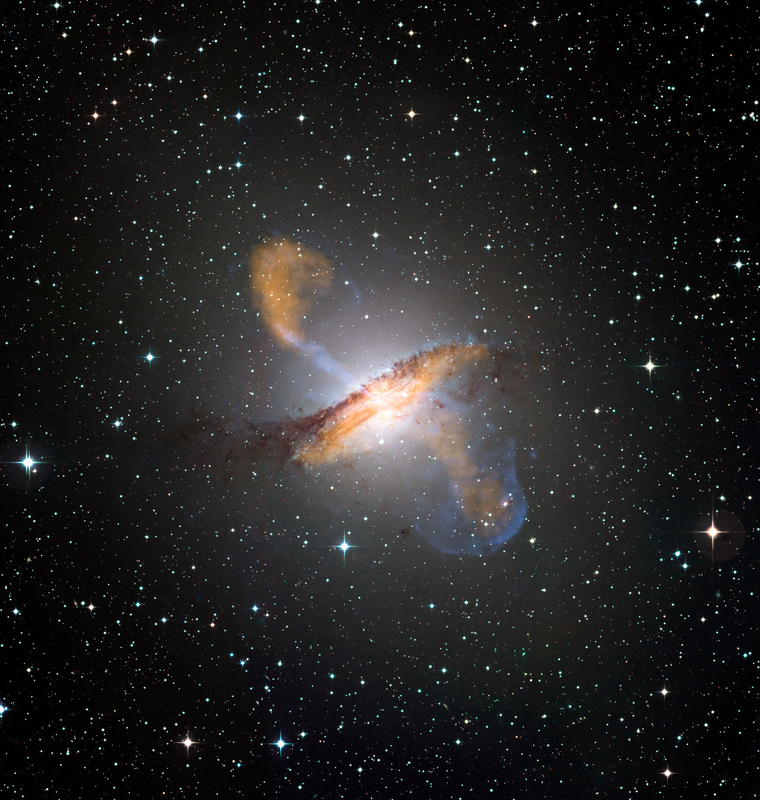 The source of those jets is a gigantic black hole in the core of the galaxy. 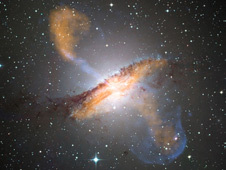 All big galaxies have one, but Cen A’s is 55 million times the mass of the Sun – nearly 14 times the mass of the black hole in the center of our own galaxy! So it’s a bruiser. Unlike our Milky Way’s black hole, the one in Cen A is actively feeding on material. A huge amount of gas is falling into it. As it does, it forms a flattened disk which gets very, very hot. Millions of degrees hot. Swirling magnetic fields and other forces focus the material into those twins beams which scream out from the disk and create the radio waves. We call these active galaxies. That fits with the collision and cannibalism I mentioned above, too: the interaction dumped a vast amount of gas and dust into the center of Cen A, where the black hole was waiting to eagerly gobble it up. Or down, I guess. I didn’t know that was visible to “regular” telescopes, so that was a surprise to me (the matter compressed by the jets has been seen in optical light – the kind we see – before, but I don’t think this clearly or with such detail). I’ve written about this galaxy before (see Related Posts, below) but I’ve never seen this. As a matter of fact I’ve looked at dozens of Hubble images of Cen A, but as deep as those were they didn’t cover very much of the galaxy, so I never saw the jets. All you could see were thousands of stars, which was still pretty cool though. But the idea that stars are forming due to those jets is amazing. We like to think of black holes as unmitigated sources of ultimate death and destruction, but that’s a bit unfair. In fact, they can be sources of creation on a vast scale; in this case, hundreds of thousands of light years. 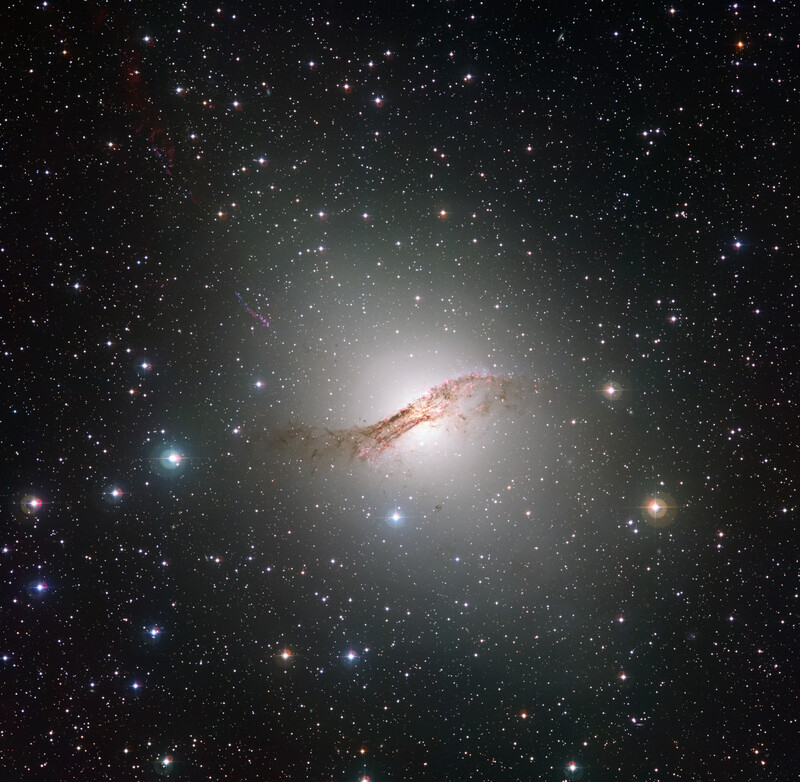 Cen A is the nearest elliptical galaxy, and the nearest active galaxy to our own. That gives us a great view of its behavior, and it’s a test case for such objects. The fact that’s so weird just adds to the fun, And this new spectacular image shows that we still have a lot to see and learn from this galaxy… and a reminder to me to not take for granted something just because I’ve seen it so many times before.